British leatherworking is alive and well. I make hand-made tooled and plain leathergoods including customised leather guitar straps, leather whippet, lurcher and greyhound collars and gorgeous soft leather elbow patches. 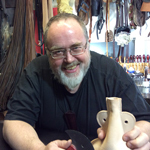 In fact, I currently offer a range of more than 500 hand crafted leather items including leather work for re-enactment and living history, a wide range of leather archery equipment (including quivers and bracers) and good strong sew-on kilt straps. I even make replacement straps with nice brass buckles for cat, bicycle and fishing baskets along with proper old fashioned hamper straps and luggage or basket rack straps for classic Morgan, Austin and MG sports cars. Suede and leather elbow patches are a speciality! Just so you know, I'm mostly a one man business and almost everything I sell is made in my own workshop or is made by friends. I take pride in the things I make, so if you have any questions then please email or call me. My contact details are here and please feel free to add a review so other people can share your experience. One last thing, I hate working out P&P charges so, no matter how much you buy, 2nd Class Royal Mail shipping to any UK address is just £2 - please ask if you require special delivery or overnight shipping (at extra cost). Important: This website is SSL Certificated and your personal data is secure. I never share personal information with anyone, and, whilst I love you all dearly, I'm far too busy to bother you with newsletters and junk emails! Finally, a sincere thank you to all who have left me feedback. Its so important that new customers can see how hard I try to get things right. Personalised black guitar straps made to order only! Much loved by bass players and&nbs..
Back in Stock!!! Leather Strop & Polish Stropboard (4 inches wide - one side ..
An easy way to buy a beautiful topstitched natural leather collar and matching 36" hand-made leather..
Whippet Collar hand made in dark brown leather with embossed Celtic design Th.. This set of classic car luggage straps is ideal for attaching suitcases and picnic baskets to a boot.. Individually made to order greyhound or lurcher collar in dark brown leather with dog's na.. I make custom sheaths for all kinds of working and bushcraft style knives. Each sheath is made i..
An easy way to buy a beautiful topstitched dark brown leather collar and matching 36" hand-made leat..
Green Man Mask This hand-tooled, hand shaped and hand coloured leather mask is made from lightwei..
Green Man Mask - Forest Lord Mask - Jack in the Green - an ideal Storyteller's Mask! This Native American design Bahco Laplander bushcraft saw belt pouch is hand-made from top qual.. I guess this is my flagship custom tooled (and personalised) black guitar strap. I get a chance to s..
Hand tooled and hand dyed in dark brown, this gorgeous veg-tan leather guitar strap is a real .. So the ratting straps caught your eye, eh? Not something you see every day and on..
Strap - Trouser Leg (ratting) Straps in Black Leather - 24" x 1/2"
Athena Bag - Elegantly finished dark brown leather shoulder bag with Viking Dragons design. .. This is an subtle and uncomplicated plain black 1.5" wide trouser belt made from supple first grade ..
Opinel No 8 - A classic high carbon steel folding knife with handmade brown leather sheath ..
Terrier Collar - 3/4" wide Hand Tooled in Dark Brown Leather to fit up to 14 Inch Neck ..
A pair of 22" x 2" (56cms x 5cms) fawn soft leather cuff bindings . Complete with pre-punched s..
Bushcraft flint and steel firelighting kit in leather pouch The magic of using flint an.. THIS TOOLED DESIGN CAN BE APPLIED TO BAREFOOT LEATHER PRODUCTS. This superb Agincourt A..
Leather Dog Collar - 13 to 18 inch neck - Dog Collar - Celtic design with natural oiled leather fini..
A pair of top quality soft Navy suede oval elbow patches complete with pre-punched stitch holes.. Suitcase Straps - lightweight and ideal for airline travel Top quality leather, caref..
Special Order for Fire Maintenance Services - 50 of 1/2" x 16" brown leather straps wit..
A pair of top quality soft DARK BROWN suede oval elbow patches complete with pre-punched stitch.. This is a very attractive 3/4" wide dog lead, made by hand in green leather and fitted with a soli..
Greyhound or Large Lurcher Collar & Matching Lead Handmade in Dark Brown Leather with Celtic Des..
Harry Potter style Leather Wand Pouch (Black) This gorgeous black leather 'wand pouch' will ..
Jeweller's Rouge Leather Strop Sharpening and Polishing Compound for bushcraft, leatherwork, wo..
A pair of 22" x 1.25" (56cms x 3cms) MID BROWN soft leather cuff bindings . Complete with pre-p.. Traditional good looks and longevity like you wouldn't believe, my supple brown guitar straps are ..
A pair of 22" x 1.25" (56cms x 3cms) black soft leather cuff bindings . Complete with pre-punch..
A pair of top quality soft mid brown leather oval elbow patches complete with pre-punched stitc..
A pair of top quality soft GREY suede oval elbow patches complete with pre-punched stitch holes.. Plain dark brown and an asset to any working musician. These straps aren't fancy or even particularl..
A pair of top quality soft Tan suede oval elbow patches complete with pre-punched stitch holes ..
Leather Strop & Polish Stropboard - one side smooth the other side rough ..